I missed yesterday’s post. Whoops! Little Miss is still not up to par, and her brother feeds off of her whining, which alters his usually sunny personality to a whiny ball of crying, and then we had errands to run…. All in all, I found myself wishing for another 3ish hours in the day yet again. 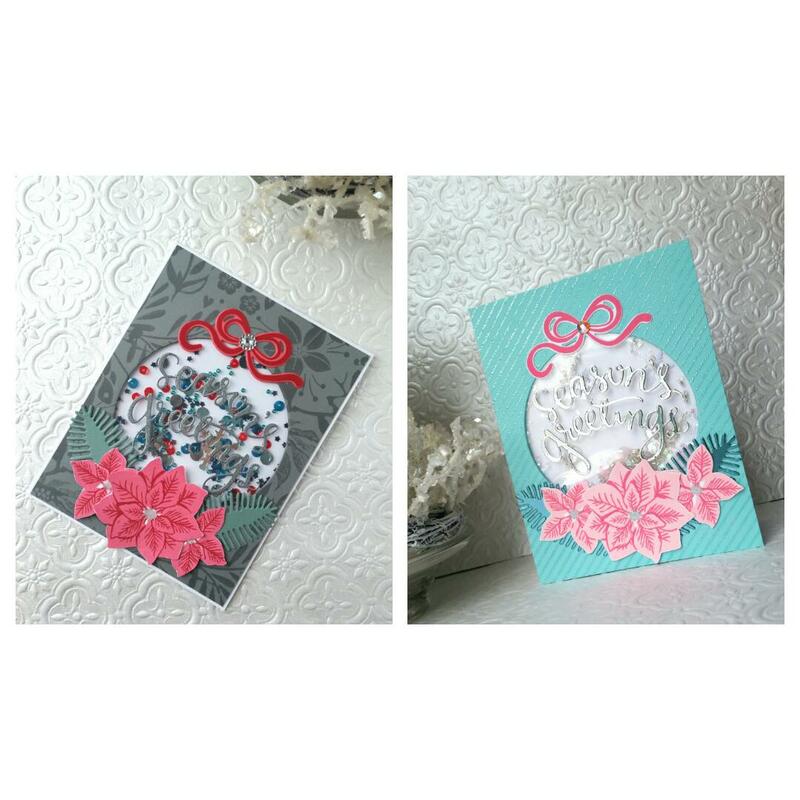 Today’s post has two cards, both with the same basic layout (another flat shaker) but with two different color schemes. The basic technique on the card was to create a flat shaker pocket with my wrmk Fuse tool, then I created a panel with a subtle background pattern. 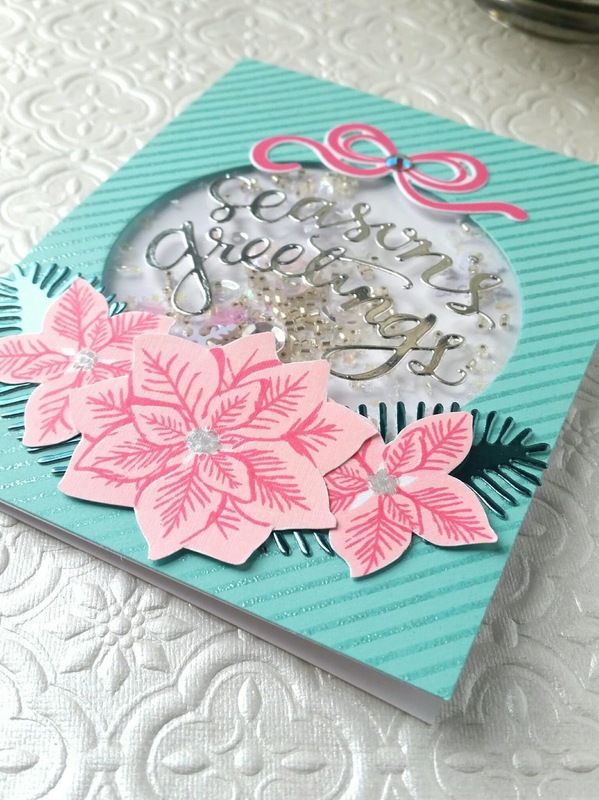 For the pink, I used the Market Street Stamps diagonal striped background in Silver Pearl embossing powder in Aqua Mist cs, and the gray panel (fog cs from Avery Elle) was stamped with charcoal ink using the Hero Arts Aspen Frost cling stamp. I die cut a circle out of the center, then added my poinsettias and pine boughs to the bottom to create a sort of half wreath. I die cut the Season’s Greetings sentiment from silver foil and charcoal glitter cardstock, then adhered them to the shaker. 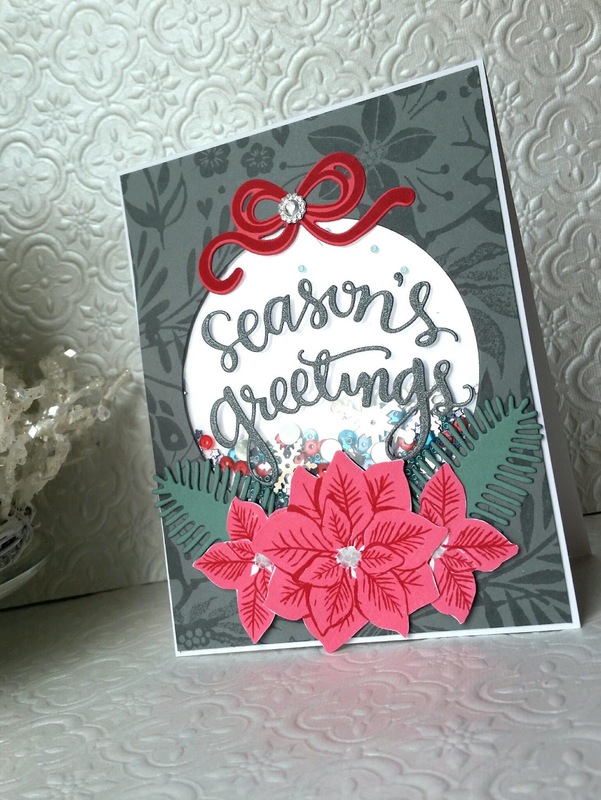 A die cut and stamped bow from the Tinsel and Tags kit finished it off!